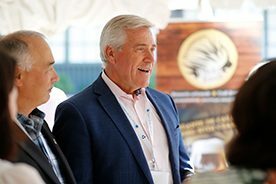 SAINT ANDREWS, NB, July 19, 2018 – Strong trading relationships are vital to Canada’s economic growth and continued prosperity. To secure a better future for Canada’s workers and communities, and to combat economic uncertainty from abroad, Premiers are enhancing existing trade relationships while building new partnerships in emerging global markets. Canada and the United States are friends, neighbours, partners and allies – a relationship based on shared values, geography and common interests. This partnership has supported economic security for both countries. Premiers will further increase their coordination and collaboration in ongoing advocacy efforts to maintain and strengthen this relationship. Building Canada’s economy also requires reaching out to emerging markets and exploring new opportunities. Premiers will be actively engaged in supporting the development of new markets for Canadian goods and broadening Canada’s trade relationships. The economic partnership between Canada and the U.S. is both long-standing and mutually beneficial. The North American Free Trade zone is the biggest economic region in the world, encompassing a $29 trillion regional market of over 480 million consumers. In 2017, bilateral trade between Canada and the U.S. exceeded $889 billion, representing over $2.3 billion worth of goods and services crossing the border every day. Nearly nine million American jobs depend on trade and investment with Canada. Over half of all Canadian imports come from the U.S. ($294 billion in 2017). Premiers stressed the integrated nature of the Canadian and U.S. economies and how the quality goods and services produced through this close-knit partnership help ensure continued prosperity for both countries. 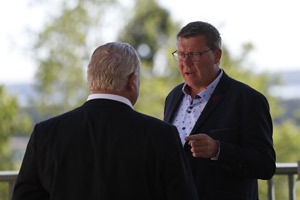 Premiers emphasized the importance of continued, vigorous advocacy by Provinces and Territories, as well as the engagement undertaken to date by the federal government with U.S. counterparts, to reinforce the mutual benefits of the Canada-U.S. trading relationship. Through continued collaboration and coordination of their efforts, Premiers will reinforce the importance of trade relationships for Canadian and American workers and their families. Premiers discussed a focused strategy to reach out to a broad spectrum of Americans on the benefits of trade between our two countries. 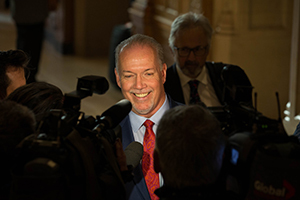 As a part of this strategy, Premiers will build upon their strong relationships with U.S. State governors with a mission to Washington, D.C. during the winter meeting of the National Governors Association in February 2019. Premiers are committed to continuing to work closely with the federal government to ensure that the interests of all Canadians are reflected in the renegotiation of the North American Free Trade Agreement (NAFTA). Free and open trade under NAFTA has led to significant benefits for all parties. It is important to take the time necessary to ensure a modernized trade agreement works for all. 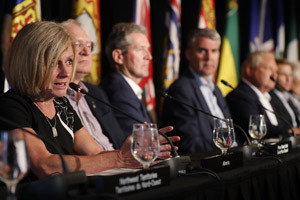 Premiers oppose U.S. protectionist policies and unfair trade actions against Canadian industries which are hurting workers, families and consumers on both sides of the border. The recent tariffs on Canadian steel and aluminum imports into the U.S. are harmful to Canadian and American producers and workers. This action by the U.S. Administration disrupts closely-linked supply chains that have made North American steel and aluminum more competitive around the world. 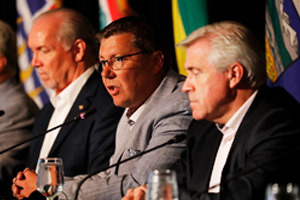 Premiers reiterated their united support for the actions taken by the federal government as it responds to unfair and unreasonable U.S. tariffs. Premiers agree that any U.S. tariffs against Canada based on the premise of U.S. national security are unfounded.